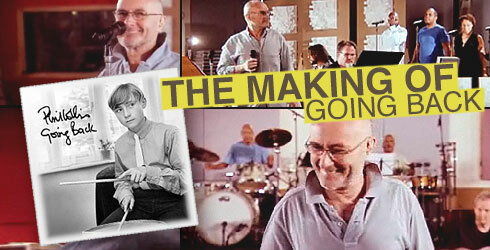 Phil Collins - The Making of "Going Back"
Back in April of last year  information leaked through that Phil was working on a new album despite his health issues. In a radio interview Daryl Stuermer revealed that the album would not be a “normal” Phil Collins record, but consist of cover versions of Motown songs only. Collins had previously released a very successful Motown cover when he included You Can’t Hurry Love in his 1982 album Hello, I Must Be Going!. At first it was uncertain whether Collins would (be able to) drum or just sing and who else would be playing on the album. One this was certain from the start, though: This would be a double album. . In October 2009 Collins gave an interview for Hamburger Abendblatt [a German newspaper]. He revealed the album would consist of 30 (!) songs by artists who had been signed to the legendary Motown label. Collins specifically mentioned Stevie Wonder, the Jackson Five and Diana Ross. He said he attempted to keep the spirit of the original songs and admitted it was “as if I tried to copy the Mona Lisa”. So there would be no own interpretations. 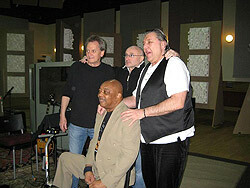 Some of this came from Ray Monette who spoke about the recording sessions early in 2010. Apparently there are now 29 songs. Monette raved about Collins’s understanding of music, but also discussed his [Collins’s] health status. It was revealed that there were drum sessions where Collins had to tape the sticks to his hands to be able to record. Monette added that things improved by and by and expressed his hope that Collins may regain full use of his hands again. Eddie Willis and Bob Babbitt are part of the legendary Funk Brothers (incidentally, so is Monette) whose career has been turned into a film called Standing In The Shadows Of Motown. Ray Monette also took a number of photos during the recording sessions. They have been published in the Rare Earth forum (follow this link) where Monette also explains that this project was very close to Phil’s heart. After these sessions strings and brass were recorded. It was not known who was involved in these sessions until the bonus DVD of the album revealed that Collins did not use the brass group of his live band but a group of first rate jazz musicians around John Aram. Strings were added to individual songs, and Collins’s sons Nicholas and Matthew added their bit, too. The idea for this album actually came from Phil’s manager Tony Smith. Phil did not want to record a “normal” album and he had not indulged in his love for Motown yet. That was the starting point. Collins began to collect songs on his iPod, recorded demos, abandoned many songs and finally decided to give the album an “old” sound. He avoided certain classics because they had been covered to death, as it were, by others. The only exception was Papa Was A Rolling Stone because Phil really wanted to do that song. The working title for the project was Twenty Good Reasons. Collins wanted to put 20 songs on the album. For some reason the number 16 began to be tossed around. In an effort not to make a ridiculously long or short album 18 tracks became the compromise. Since Collins found it very difficult to choose from the 29 songs he had recorded they came up with a Special Edition that would contain all 29 songs from the sessions. 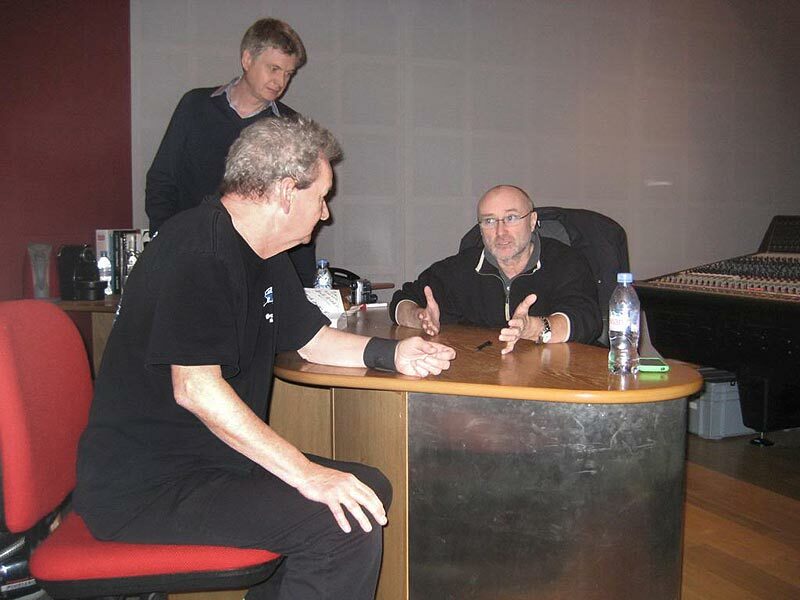 During the recording of the album, which was mainly done in Switzerland, Phil decided to bring the project to the stage. A small number of concerts, so-called showcases, were scheduled for North America. These took place in June, some three months before the album would come out. One of the shows was recorded for a DVD release. Rumours that this DVD would become part of the Special Edition turned out to be untrue. Going Back: Live At Roseland Ballroom, NYC will be released separately on Blu-ray and DVD. Competition: Win one of 5 Live At Roseland Ballroom (Phil Collins) DVD or Blu-ray discs! Steves first Soloalbum from 1975, with Phil Collins and Mike Rutherford. Remaster Version from 2005 with Bonustracks.